Study adds to earlier research showing autism-related attention differences at 6 months; opportunity for earlier intervention? Infants who go on to develop autism not only look at faces less than other babies do, they also tend to look away from important facial features when a person speaks, according to a new study. The findings, by researchers at Yale University School of Medicine, appear in the February issue of Biological Psychiatry. They add to those of a recent eye-tracking study that likewise associated autism with subtle differences in attention to faces among 6-month-old babies. “Babies who later develop autism may already have difficulties focusing on important social information at 6 months,” says study author Frederick Shic. “This, in turn, could be hampering the early development of their social and communication skills.” Dr. Shic’s co-authors included Yale psychologists Suzanne Macari and Katarzyna Chawarska. “If children at high risk for autism are identified at such an early age, it may be possible to develop ways to assist their social development,” comments Alycia Halladay, Autism Speaks senior director for environmental and clinical sciences. 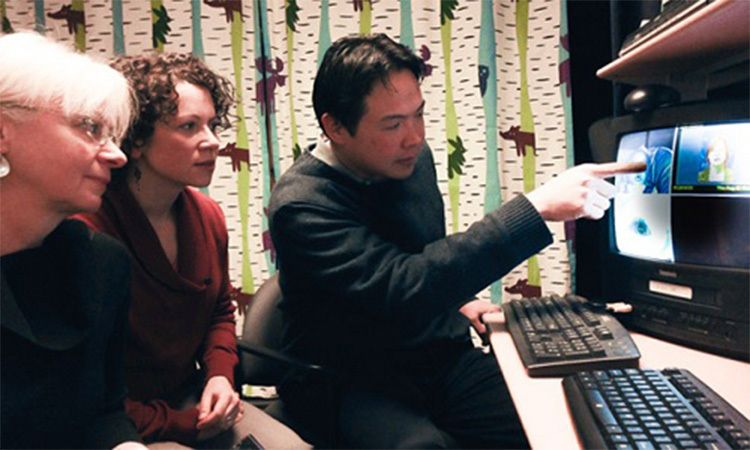 Dr. Shic is part of the Autism Speaks Baby Siblings Research Consortium (BSRC). The BSRC brings together research groups from around the world with the mission of discovering the earliest predictors of autism. Much of their research focuses on the younger siblings of children diagnosed with autism. These “baby sibs” are at higher than average risk of developing autism because the disorder tends to run in families. In their new study, the Yale researchers used eye-tracking technology to map the eye movements of 99 infants. Some were high-risk baby sibs. Others were from families unaffected by autism. In the experiment, the babies watched three videos: One showed still faces. Another showed expressive faces. A third featured the faces of people speaking. Two and half years after the experiment, the children received full diagnostic evaluations for autism. As a group, the babies who went on to be diagnosed with autism spent less time looking at faces than the other infants did (figure below left). They were also far less likely to look at the eyes and mouth of a person speaking (figure below right). These inner facial features convey important social information. At present, autism can't be reliably diagnosed until 2 years of age. But this study adds to a growing body of research suggesting that autism-related attention problems emerge far earlier. Babies who later developed autism looked less at scenes containing faces of people speaking than did other infants (left). When they did look at speaking faces, these babies tended to look away from important inner features such as the mouth and eyes (right). asd = later diagnosed with autism. 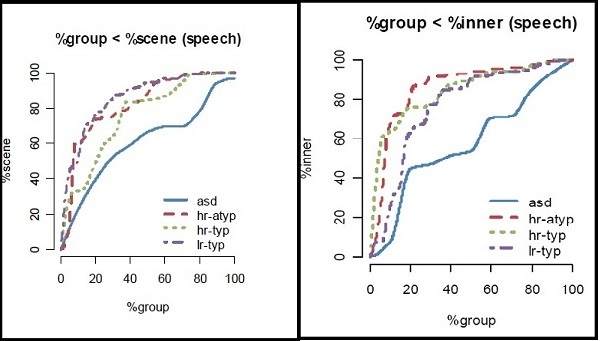 hr-atyp = high-risk baby sibling with atypical development (some signs of autism). hr-typ = high-risk baby sibling with typical development. lr-typ = low risk baby with typical development. Figures from Shic et al 2014.